St Leonards: Proudly supporting the Humpty Dumpty Foundation. As part of its philanthropic commitments through the Eva and Les Erdi Humanitarian Charitable Foundation, Hotel Urban St Leonards proudly supports The Humpty Dumpty Foundation. The Humpty Dumpty Foundation supplies vital medical equipment to children’s hospitals all over Australia and allows donators to choose not only the specific piece of equipment they would like to contribute towards, but also the recipient hospital. Hotel Urban St Leonards has nominated the nearby Royal North Shore Hospital to be the beneficiary of their fundraising efforts in 2017. 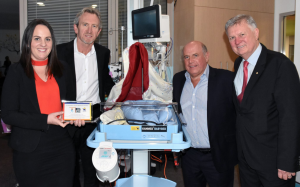 They have already raised enough to supply one Kanmed Baby Warming Bed to the Newborn Intensive Care Unit at Royal North Shore Hospital (valued at $14,750) and are now working towards a second. Funds were raised for this cause through generous guest donations, charity funs runs and various in house team initiatives to reach their goal of $7375, which the Eva and Les Erdi Humanitarian Charitable Foundation matched dollar for dollar. For more information about the Humpty Dumpty Foundation, check out their website.